clustering the TEL specific keywords from a conceptual, theoretical and methodological perspective. Edited by recognised authors in the area, the TEL dictionary provides definitions based on key references and selects preferably open access resources for further explorations, and in particular those of the TEL open archive. As part of the thesaurus construction, it is also important to have a better knowledge of how words are semantically linked together. For this purpose, we have explored different Telearn corpora (french, english or collection such as the ARV 2011 White papers). We have selected a list of keywords that appear significantly in their respective corpus. We have then looked at the context of use of each single word (with a threshold of 50 words after or before, i.e. more or less a paragraph). As a result, each word is associated with 1 to 3 other words. 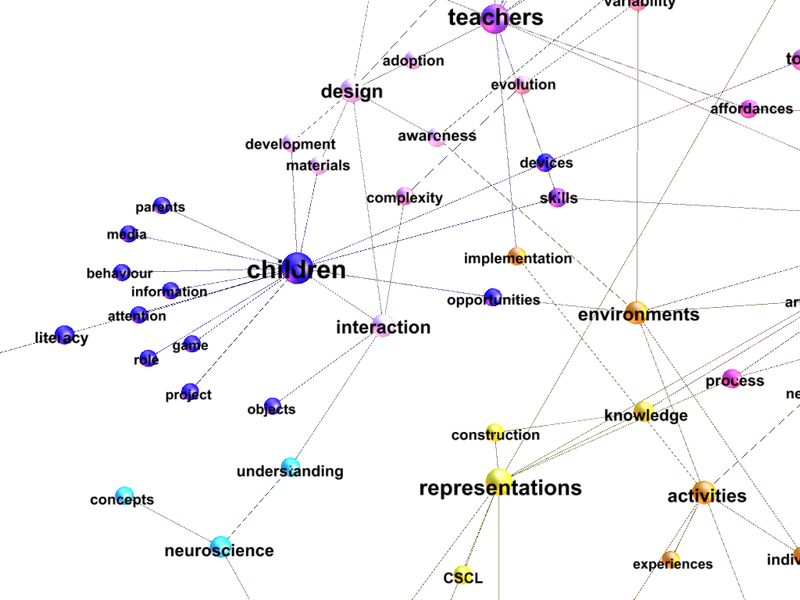 We're using Gephi software for the visualization so as to create a contextual map representing each corpus.